What is Ian Kimmerly Stamps? 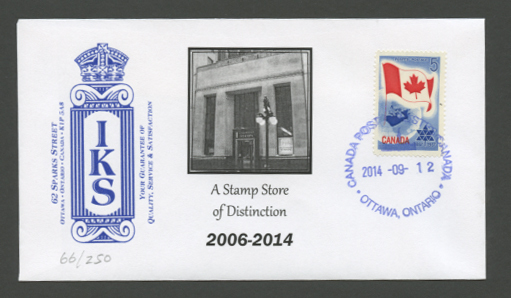 From 1987 to 2014, Ian Kimmerly Stamps was a full-service, retail stamp shop in Ottawa, Ontario, Canada. As a store, it began business in 1984 on the Sparks Street Mall in Ottawa, and continued thriving and serving collectors in the Ottawa region and, increasingly, throughout North America and the world. On September 27th, 2014, Ian closed the doors on his retail store, and moved to Victoria, BC, where he continues to oversee the on-line business. Ian Kimmerly is a well-regarded Canadian stamp dealer and collector. He has won a national vermeil medal for his Prince Edward Island cancels and collects literature, fakes and forgeries, and Solomon Islands. From 1976 to 1991 he was the weekly stamp columnist for The Ottawa Citizen and later the Toronto Globe & Mail. For more background, see Ian’s philatelic biography. Ian is also the President and auctioneer for Sparks Auctions of Ottawa. What do you have for sale on-line? Our site is meant to showcase much of our retail inventory in a conveniently-organized and well-displayed format. See the Search page or follow one of the links on our home page to get started looking around. You can search for a specific country, topic or term, or simply follow the links to countries of interest and browse the entire listing. What countries do you specialize in? Can I pay for goods with my credit card, and is it secure? Our Zencart on-line store is completely secure and encrypted. We do not have access to your account password. If, however, you do not wish to store your credit card information, you may call us at 250-413-3138. Yes. Our web store is configured so that you can also show prices (approximately) in US$, Euros, GB£ and Australian dollars. We will provide invoices in US dollars for American customers who request it, and accept US dollar cheques. In the case of credit card sales, our bank requires us to bill in Canadian dollars which are then converted to US by your credit card company at their prevailing exchange rate. Exchange rates change daily, so check a currency site like XE.COM for latest rates. Do I have to pay taxes when I buy something from your web site? We must charge 13% Canadian Harmonized Sales Tax on items sold to the following Canadian provinces: Ontario, New Brunswick, and Newfoundland & Labrador. 15% HST applies for Nova Scotia, 12% HST is charged to British Columbia customers, and 5% is charged elsewhere in Canada. Items which are exported to the United States or elsewhere out of Canada are not charged tax. What services are available on your site? While our site is intended to provide a comprehensive retail presence, you can also join our mailing list for special e-mail offers, and find links to our current listings on eBay, Bidstart and Delcampe. Do you have public stamp auctions? From 1990 to 2001, Ian Kimmerly Stamps held stamp auctions at our store in Ottawa. We produced a lovely catalogue for each sale, usually featuring several pages of colour reproductions. The auctions were very successful and featured some memorable highlights, including the sale of a several Twelve Penny Blacks. We found the auction business to be exciting, demanding, and time-consuming. Ultimately, though, we decided to turn our energies to new markets and methods of reaching customers. There are no plans at this time to hold future public auctions. In 2007, a new firm was established under the name of Sparks Auctions, with Ian Kimmerly serving as President and Auctioneer. Sparks’ auctions are truly international, with a vital internet presence. The live auctions are conducted before floor bidders and, via the on-line services of StampAuctionNetwork.com, on the internet as well. Can I give you my Want List? Will you find a specific stamp for me? We do keep want lists for advanced collectors of some areas, in most cases specifying items with catalogue values of $100 and up. We also enjoy locating those elusive but lesser value items that seem to leave a gap in many collections. Contact us for more details. A “philatelist” is a stamp collector! I have a question that wasn’t answered here. How can I contact you? Our contact information is below (and on every page on our web site). We do our best to reply to e-mail at [email protected] within a day of receiving it. We would be delighted to hear from you!